The transient second class rate was available for mailing newspapers or periodicals by other than a publisher or registered news agent. A rate of one cent per two ounces, total weight to be less than or equal to eight ounces, was in effect from July 1, 1928 until April 1, 1952. 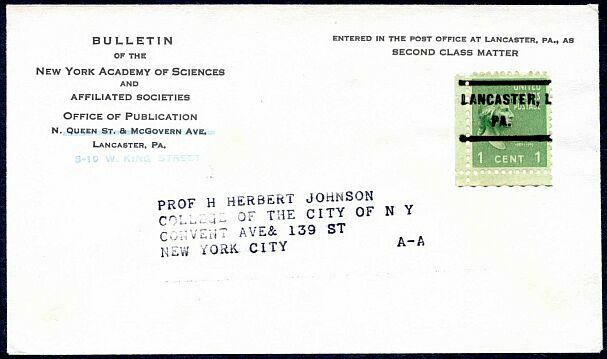 A small Bulletin of the New York Academy of Sciences was sent for one cent as second class matter. 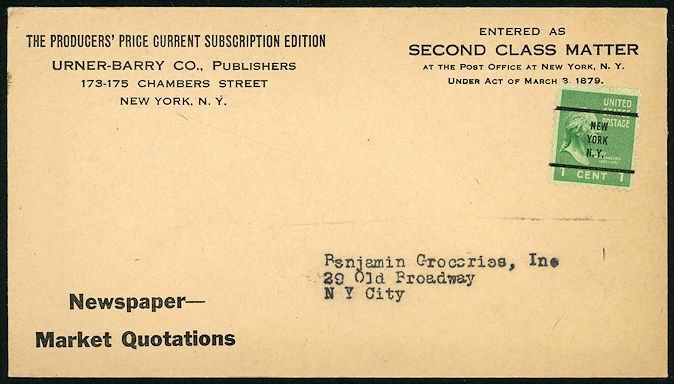 Second class mailings of newspapers (other than weeklies) and periodicals for letter carrier delivery within the origin post office also used postage stamps or meters. The rate was one cent for items weighing two ounces or less from June 8, 1872 until July 1, 1998. This small wrapper was used to send a newspaper as second class matter within the origin post office. The reference at upper right to the Act of March 9, 1879 shows that this mailing was not done under the transient rate schedule, which did not become efective until 1884.